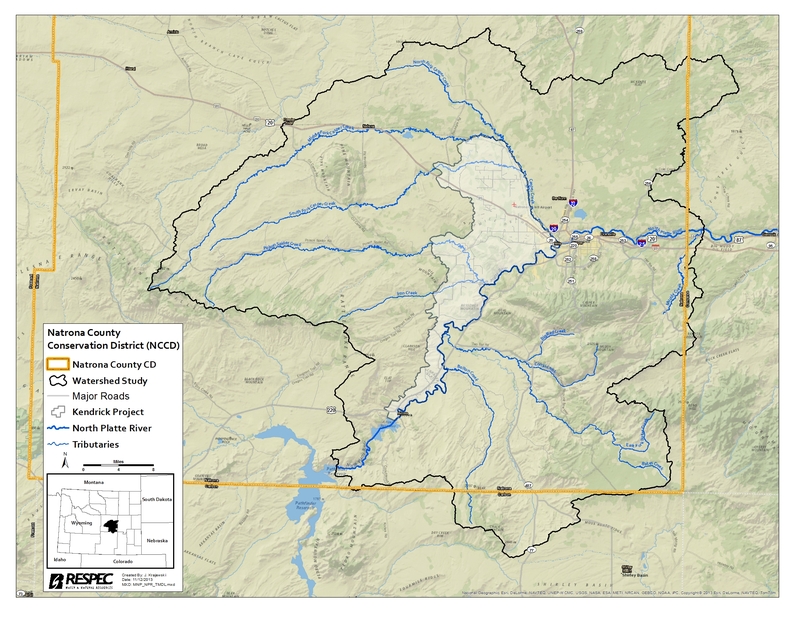 In September of 2011, Natrona County Conservation District applied to the Wyoming Water Development Commission (WWDC) for funding for a Level I Watershed Study to be completed on a Middle North Platte River Sub-watershed. The study was recommended to the Wyoming State Legislature and the funds for the study were approved in Spring of 2012. In May of 2012, consultants were chosen by the WWDC to complete the watershed study. 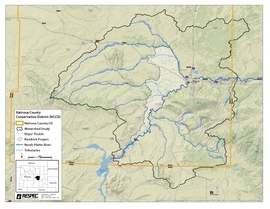 The study area was downstream of Alcova Reservoir to the confluence of Muddy Creek and the North Platte River, approximately 2,112 square miles, and included four impaired ponds or reservoirs and five impaired streams or creeks, as well as a 36-mile segment of the North Platte River as it flows through the City of Casper. Click on the map for a larger view of the study area. The Level I Watershed Study compiled pre-existing data on the watershed with newly collected data into a Geographic Information System (GIS) geodatabase and digital library in order to establish a comprehensive watershed management and rehabilitation plan. More specifically, the project studied surface water availability and storage, assessed irrigation systems and possible enhancements, analyzed rangeland and grazing patterns and their potential improvements, addressed wetland and riparian restoration along with channel stability project potentials, discussed selenium reduction and management goals and proposed invasive and noxious weed management options. As a result, the study has generated a watershed management and rehabilitation plan that is technically sound, practical in nature, and economically sound. The plan includes short and long term recommendations for water resource management on private and public lands, the potential costs and funding sources for project implementation. This comprehensive, interdisciplinary study will undoubtedly help to serve the needs of conservation efforts on a local basis and help to increase water quality and quantity throughout our watershed! RESPEC Consulting and Anderson Consulting Engineers began collecting preliminary data on the watershed by meeting with landowners, as well as county, city, state and federal agencies. This data includes background information, inventorying and mapping land and water resource features for participating landowners, and investigating water storage and development opportunities within the study area. Bates Creek landowners have shown an incredible interest in the Level I Watershed Study! Over the summer, in coordination with NCCD, efforts were focused on reviewing previously gathered data from the University of Wyoming, Wyoming Game & Fish, and the North Platte River geodatabase. Water quality sampling, stream flow measurements, and transducer data collection took place monthly and were added to the extensive database. In August, more than forty area land-owners participated in public meetings to learn about the study and how the outcomes might be used for water and land-use improvements, livestock and wildlife water resources development, irrigation rehabilitation projects, and water quality enhancements. Environmental consulting firms RESPEC and Anderson Engineers have worked diligently throughout the year to see the completion of this project. Representatives from these firms have continued their work with private land owners and local agencies, and are making their touches on the final report. With the completion of this study, landowners in the Middle North Platte River Watershed will now be eligible for state and federal funding to assist with projects that improve water quality and quantity, increase habitat for fish and wildlife, and address environmental concerns. We are very excited to be a sponsoring agency for these grants and encourage residents to contact us about potential projects and their funding. The Small Water Project Program (SWPP) is just one program that assists local residents in natural resource development and improvement. A total of six applications have been completed and submitted to the WWDC for approval as part of the SWPP. If you are interested in applying for this program and would like learn more about SWPP click here. 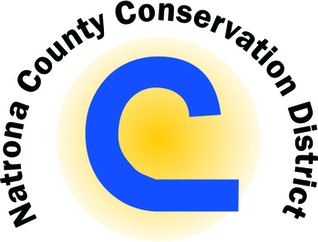 Natrona County Conservation District would like to express its appreciation to all of the landowners who volunteered and cooperated in this study for doing their part in furthering efforts to conserve our natural resources!